It’s no secret among job hunters that the process of getting a job can be grueling. Between preparing resumes, writing cover letters, and sifting through lackluster job listings, the application process doesn’t get a lot of love. As an HR leader, you know that it goes both ways. Recruiting, hiring, and retaining top talent is a complex and time-intensive job itself. Unfortunately for both sides, the process often ends in disappointment, frustration, and missed opportunities—often before the candidate is even through the door. The recruiting funnel has a notoriously high churn rate. According to some studies, 60% of job candidates abandon their online applications because the process took too long or was too complex (some estimate the rate is even higher). For employers, this churn results in loss of top talent, reduced ROI on recruitment investments, and potentially bad reviews from would-be candidates. Today, candidates have high expectations and a lot of options. To attract the right people for the job, you need to step up your recruiting game by optimizing the application process and focusing on the candidate experience. Use the following seven tips to streamline your application process. Before you do anything else, you need to document your current processes. It will give you a clear and accurate understanding of your as-is process, which you’ll need in order to optimize your process and eliminate inefficiencies. By going through the application yourself, you can better understand the process from the candidate’s experience. These elements have a significant impact on the candidate experience. By putting yourself in your applicants’ shoes, you can understand the process from their side and design a candidate experience with them in mind. Lucidchart can help you document your entire hiring process and map out your plans, from deciding where to post or advertise open positions to extending an offer to a candidate. With ready-made templates, you can get started right away. Once you have your current process documented, you can identify opportunities to simplify the application. Look for ways you can reduce the number of steps to apply for a job. The more hoops candidates have to jump through, the less likely they are to complete the application process. 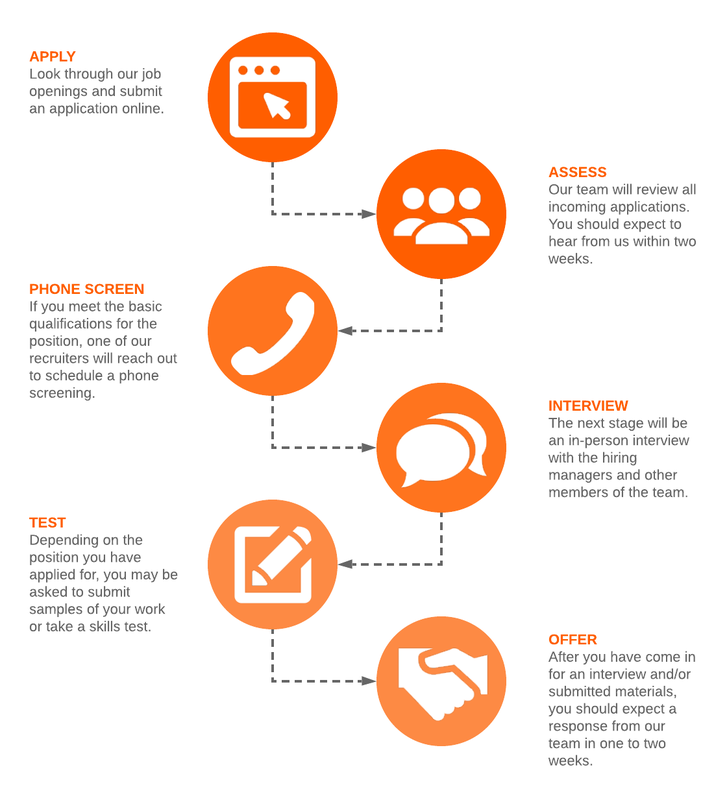 Within each of those stages, the applicant will go through multiple steps as they work their way through the application and hiring process. Use your as-is process map to work through each stage. Consider your overall user experience and note any areas that could be simplified, clarified, or even eliminated. For example, are there any questions in the initial application that would be “nice to have answered” but could be asked at a later stage in the screening process? In addition to simplifying the process, you also want to optimize it. Today, candidates rely on the Internet to conduct job searches and submit their applications. For many, this includes searching on job boards as well as general Google searches. In fact, 30% of Google searches (about 300 million per month) are job-related. But if candidates can’t find your job listing, you will lose out on key talent. Most people focus on just the first page of search results, so make sure candidates can easily find your job listings through SEO by sharing info that candidates want to know. Share the salary range for the position. Identify job location and travel requirements explicitly. Be specific and clear in the job description. Use common keywords and terms related to the job in the description to make it more searchable. Clear listings that include key information like salary and location are more competitive in the search rankings. In addition to SEO, make the online application process user-friendly. 52% of candidates use their smartphones to search and apply for jobs. As you simplify and optimize the process, make sure it’s optimized for both desktop and mobile users. Limit the number of fields to fill in and the number of screens to navigate through. Keep the description itself concise and break up blocks of text so it’s easier to skim through the job requirements on a mobile device. Optimizing the user experience for mobile will put you a step ahead of the competition and improve your candidates’ experience and retention rates. Ultimately, candidate experience relies on improved communication between both parties. When asked for their top five frustrations when looking for a job, 48% of candidates said employers leaving them in the dark about their candidacy and 31% said employers not acknowledging receipt of their application. Fortunately, the solution is clear (if not always easy to implement). This is a simple gesture that goes a long way for job seekers. Many candidates are submitting multiple applications each day. Without confirmation, candidates wonder if their application went through successfully (you never know with technology!). Save them the stress (and potential hassle of re-submitting an application) with an automatic confirmation email. Following up with candidates should be common courtesy, but unfortunately, in the hustle and bustle of hiring, many are left in the dark wondering why they never heard back from the hiring manager. Following up is particularly important for candidates who have advanced past the initial application and have gone through the screening and interview steps. Keep candidates updated throughout the process. Tell them if you have moved forward with another applicant or if the circumstances have changed and the job is no longer open. Most people wait only a couple weeks before writing off the job, so if the process is taking a while, let them know they are still in the running. If you set clear expectations from the beginning and share your job hiring process steps, candidates will have a better experience. Lay out your process so they understand what steps are involved and what they should prepare for. You can even publish an FAQ section on your careers page to clarify questions would-be applicants might have. In the end, being open and honest with your candidates will improve the whole experience and keep everyone on the same page. Streamlining the application process is a big task. Lucidchart is a visual diagramming solution that can help HR leaders and hiring managers to improve process efficiencies and outcomes from start to finish. As you evaluate your process, easily document your as-is and to-be processes in Lucidchart. 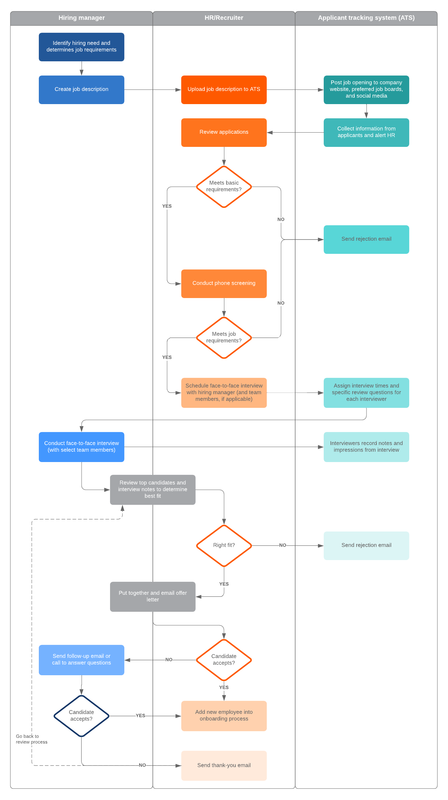 Clean and elegant flowchart designs help you visualize each step of your funnel and identify bottlenecks and opportunities for improvement. Once you have a new process in place, use Lucidchart to make each step simple and clear with checklists, roadmaps, interview scripts, and even org charts to onboard new hires. As we know, a great application process depends on great communication. Lucidchart is cloud-based, which makes it easy to share your work with team members and stakeholders and collaborate in real time so everyone is on the same page and no candidate falls through the cracks.